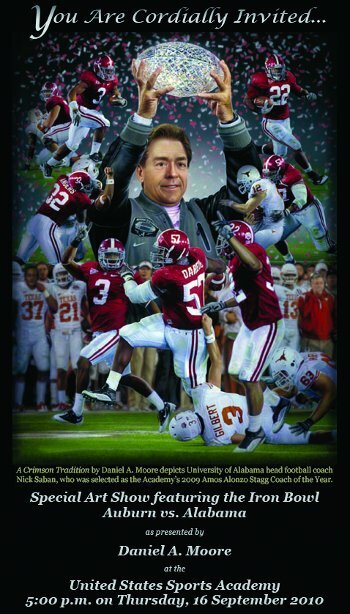 Forty-one certified limited edition prints depicting the Alabama-Auburn football rivalry will be displayed and auctioned at a special art show where the painter, Daniel Moore, will also unveil the 2009 College Football Game of the Year painting on the United States Sports Academy’s campus at 5 p.m. Thursday, 16 September. Moore, the American Sport Art Museum and Archives (ASAMA) 2005 Sport Artist of the Year, donated the 41 prints featured in his book Iron Bowl Gold, to ASAMA. Each of the prints will be made available to the public in a silent auction during the art show. The prints depict each of the Alabama-Auburn games, traditionally called the Iron Bowl, played from 1948 through 1988. Copies of Iron Bowl Gold will be available for purchase during the art show, where guests will have the opportunity to have their copy personalized by Moore. Written by legendary football announcer Keith Jackson, the book also features articles from past issues of The Birmingham News. During the art show, Moore will also unveil the Academy’s commissioned painting for the 2009 College Football Game of the Year Award, depicting the University of Alabama’s 32-13 victory over the University of Florida in the Southeastern Conference Championship game. The College Football Game of the Year Committee also includes such former esteemed coaches as Hall of Famer Vince Dooley from the University of Georgia; Dr. Homer Rice, the former head coach at Rice University and longtime Georgia Tech athletic director; and Ron Dickerson, the first African-American head football coach in National Collegiate Athletic Association (NCAA) Division I-A history.